Unique among Sherlock Holmes pastiches are the adventures of Solar Pons "the Sherlock Holmes of Praed Street." On hearing that Sir Arthur Conan Doyle had no plans to write more Holmes stories, 19-year-old August Derleth wrote the author asking permission to take over the series. 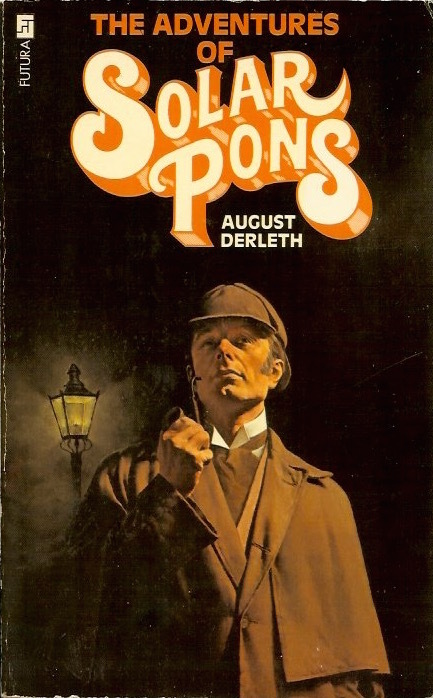 Doyle declined, so Derleth created his own detective, Solar Pons, modeled very closely on Sherlock and his world. Derleth would ultimately write more Pons stories than Doyle wrote about Holmes. First published in 1945, this is a 1976 UK paperback of the first collection of Pons stories with terrific cover art. In his inverness cape Solar Pons steps briskly from No 7B Praed Street onto the mist-shrouded cobblestones of old London's alleyways. Check out the official Solar Pons website: www.solarpons.com. You can also Like Solar Pons on Facebook.